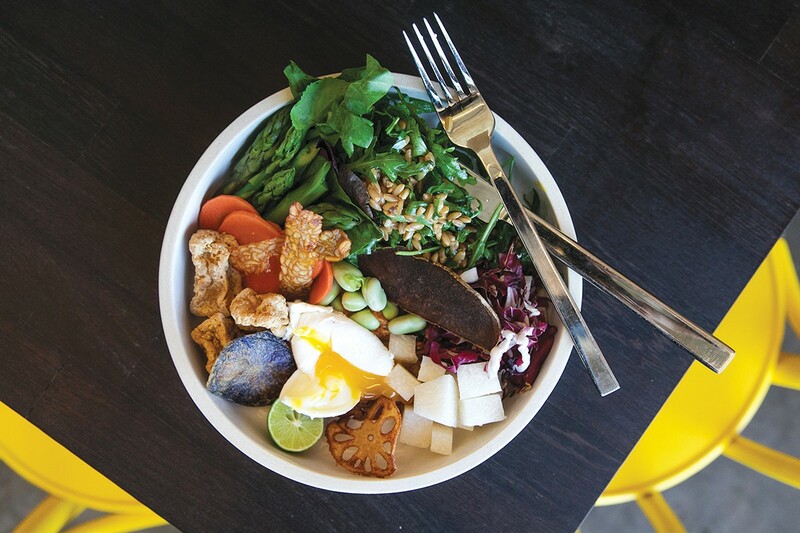 Drip Line’s gado gado, an almost-vegan dish featuring seasonal veggies, poached egg, and peanut sambal. 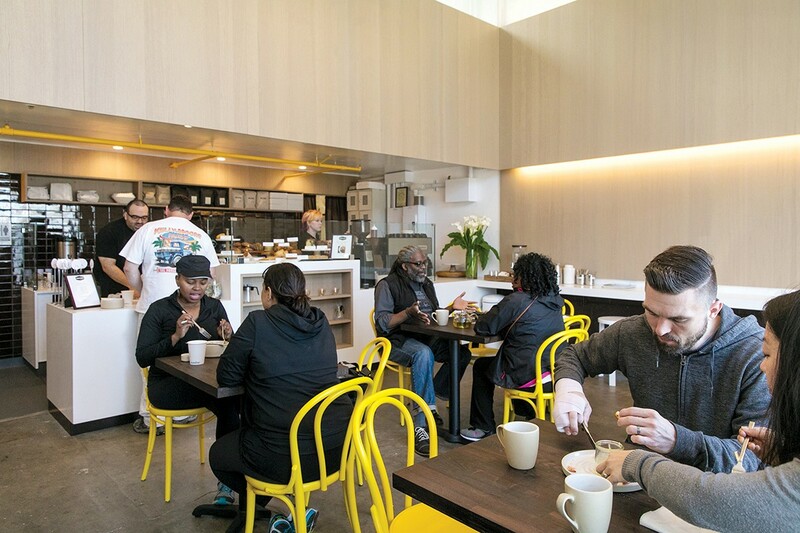 At Drip Line, the new third-wave cafe and farm-to-table restaurant in West Oakland, good design is everywhere. It’s in the glossy magazines stacked in the corner; its name, a reference to the path of water from rooftops to the ground; and its seemingly effortless fusion of Singaporean and California cuisine. The whole place reminds of how good design makes things like the iPhone so habit-forming. Like anything well-designed, I could definitely see Drip Line becoming a habit. It certainly did its best to win me over. First, it softened me up with its clean, modern Blue Bottle-like space. Then, it cozied up to me with a Four Barrel cappuccino and a five-spice morning bun — gooey at its center, spicy with pepper and cinnamon, and a fluffy crust, glazed and crunchy with caramel. By the time I tasted Drip Line’s bright, freshly made sambal, a Singaporean condiment that dances on the tongue, I considered myself well had. Chef Nora Dunning describes her food as who she is, influenced by a childhood in Singapore, cooking beside her mother, a caterer, and seminal eating experiences in Italy. “I thought, ‘Why don’t they have it here [in California],’” Dunning said of the food she enjoyed abroad. “Well, it turned out it was but it just wasn’t as popular yet.” Eventually, while cooking at Crema and Monkey Forest Road, she realized she wanted to use the same seasonal, fresh approach with Singaporean flavors. Singaporean cuisine is having a moment right now: Momofuku’s chef de cuisine is Singaporean, a hawker stand in Singapore recently earned a coveted Michelin star for its $2 chicken rice dish, and one of chef and TV personality Anthony Bourdain’s current projects is a Manhattan food court modeled after Singapore’s open-air ones. It’s easy to see the appeal; when I tasted Dunning’s food, in which Southeast Asian flavors played coy, they didn’t bop me over the head with funk or spice, but amiably tingled and smoked. The food scenes both in Singapore and Northern California are vibrant and multicultural, giving Dunning lots of room to groove — and groove she does. Well-equipped with specialty chilies, chois, and fiddlehead ferns grown by Oakland’s Kosodate Farm, as well as produce from City Slicker Farm and the Old Oakland Farmers’ Market, Dunning inserts pops and wallops of housemade sambal, Japanese matcha, Chinese five-spice, and coconut into a slew of tried-and-trues — burgers, fried-chicken sandwiches, morning buns, and pop tarts — plus a liberal smattering of her take on Singaporean mainstays. A few words about the sambal, upon which much of Dunning’s menu hangs. The Singaporean condiment can either be whipped up in a matter of seconds, or coaxed into being with a long simmer. Dunning’s is the latter. It cooks for hours, until its chilies and garlic are friendly on the palate, and the galangal is a breath of fresh air. I caught whiffs of an umami pungency that I assumed was fish sauce or shrimp paste, but Dunning insisted no. That whisper of funk is just from long cooking. Dunning’s sambal showed a particularly comforting side when blended with ground peanuts in Drip Line’s beautiful gado gado, an almost-vegan dish in which seasonal veggies hog the center of the plate. A poached egg’s yolk ran a path connecting the peanut sambal and mounds of tender, crisp sugar snaps, broccolini, and cauliflower; golden cubes of fried tofu; arugula tossed in vinaigrette; and chewy grains of quinoa. Fried crisp lotus root and purple potato chips made it pretty and crunchy. Blended into an aioli, the sambal’s smoky notes, and its fresh, sunlit kiss of galangal played nicely with the aioli’s garlic punch. The aioli went wonderfully with Drip Line’s deeply caramelized sweet potato fries and its burger, in which it mingled freely with the beef patty’s clear, pink juices and Dunning’s kicap manis: a soy-based, barbecue-like sauce sweetened with molasses and spiced with Thai bird’s eye chilies, lemon juice, ginger, and garlic. Neither sauce overpowered the beef’s buttery richness. Instead, it roused me to wonder at the tangle of flavors. The poofy, house-made brioche bun, glazed golden and sprinkled with sesame seeds, collapsed slightly at the pressure of my fingers but stayed together. The koji fried chicken sandwich was less dramatic. The marination of chicken in koji, a fermented rice used in brewing sake, made it tender, but in a sea of other restaurants making equally solid fried-chicken sandwiches, it didn’t stand out. I liked the chicken rice more, in great part because of the succulent chew of the chicken thighs, a result of its poaching, via sous vide, in chicken stock, and then grilled with a liberal application of kicap manis. Drench the turmeric brown rice thoroughly with the accompanying chicken broth for an all-chicken, all-the-time effect, or you may find it a tad dry. I had a few quibbles. Some people, looking for extra heat or funk, might find themselves asking for more chilies, sambal, or a bit of fish sauce. Less rectifiable perhaps is that the place is small, with lots of hard surfaces. When it’s full — which it often is — I’ve ended up contending with bouncing sound and squeezing around people to get to an empty stool. On the whole, Drip Line gives people what they want: a good cup of coffee, WiFi, a good burger, friendly service, as well as few things they didn’t know they wanted, such as freshly made mango pudding. All that’s needed, if needed is the word, is a glass of rose, a Singaporean beer, and weekend hours — all of which are on the way.